The data portion of the safe must maintain an interior temperature less than 125F and an interior relative humidity less than 80% for class 125, when exposed to fire as per the Standard Time Temperature Curve for 3 hours to 1925F. The UL test for the records portion calls for the safe to be heated to 1550 for 30 minutes then dropped onto concrete rubble from a height of 30 feet. Then it is inverted and reheated for another 30 minutes. 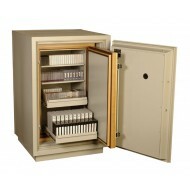 The safe must maintain its integrity throughout the test and protect all contents. We have not listed a price for this. PLEASE CALL FOR A QUOTE 877-442-9964. 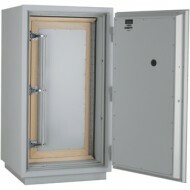 Mesa TL Safe has the ability to withstand severe attacks by experienced U.L. experts using powerful tool such as sledgehammers, power saws, carbide disc cutters, drills, etc., and without fail, were awarded the U.L. TL-15 and TL-30 labels. Besides withstanding the most concentrated attacks by sophisticated burglars, each Mesa TL Safe offers a 2 Hour, 350°F factory rating, ensuring the protection of the vault's contents against intense fires. The door is constructed with a 2-3/4" defense barrier of outer and inner steel plates creating a single structure enclosing a unique, high-density fire and burglary resistant composite material. The defense barrier houses a propriety amalgamation of nuggets and steel fibers to withstand concentrated attacks with the most sophisticated equipment used by burglars today A massive 1-1/2" diameter chrome plated solid steel locking bolts, each bolt moves deep into the body's protected bolt chambers. 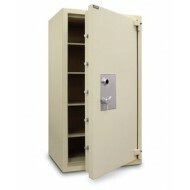 The safe is equipped with heavy-duty solid steel hinges. The formed body has a total protective thickness of 3-1/2" enclosing a high-density fire resistant composite material with nuggets and steel fibers. The reinforced drill resistant doorframe protects the door and each individual bolt chamber from severe side attacks. 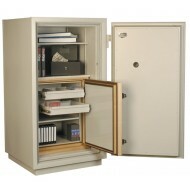 The safe features high strength adjustable shelves and a U.L. listed group 2 combination lock. A massive drill shattering hard plate and 2 punch-activated relocking systems protect the lock. The safes have a 2 hour, 350°F factory fire rating and have been tested in temperatures up to 1850°F. When exposed to fire as per the Standard Time Temperature Curve for 3 hours to 1925F. this safe kept an interior temperature less than 125F and an interior relative humidity less than 80% . 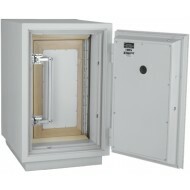 This safe also passed the the Humidity Test, the Fire and Impact Test and the Fire Endurance Test. The safe did not explode or break open through 30 minutes to exposure to a 2000F fire and immediate 30 foot drop test and a standard reheating for one hour to 1700F. 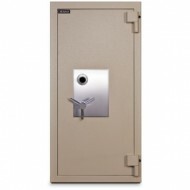 The Mesa TL6528 Safe has the ability to withstand severe attacks by experienced U.L. experts using powerful tool such as sledgehammers, power saws, carbide disc cutters, drills, etc., and without fail, were awarded the U.L. TL-15 and TL-30 labels. Besides withstanding the most concentrated attacks by sophisticated burglars, each Mesa TL Safe offers a 2 Hour, 350°F factory rating, ensuring the protection of the vault's contents against intense fires. The solid beuild includes heavy bolts, strong hinges, and a heavy built door and body. The Mesa TL-30 offers a massive solid steel hard plate covering the entire body. Each TL30 safe comes equipped with a UL rated II combination lock for its drill resistance. 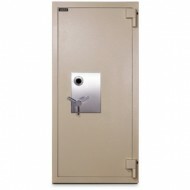 Due to the weight of this safe, please call for a quote. 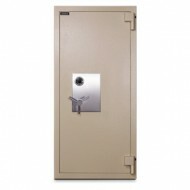 Mesa TL Safe has the ability to withstand severe attacks by experienced U.L. experts using powerful tool such as sledgehammers, power saws, carbide disc cutters, drills, etc. The MTLE6528 was awarded a TL15 label. Besides withstanding the most concentrated attacks by sophisticated burglars, each Mesa TL Safe offers a 2 Hour, 350°F factory rating, ensuring the protection of the vault's contents against intense fires. The Mesa TL-30 offers a massive solid steel hard plate covering the entire body. This safe achieved its fire rating by maintaining an interior temperature less than 125F and an interior relative humidity less than 80% for class 125, when exposed to fire as per the Standard Time Temperature Curve for 3 hours to 1925F.